Uncover the archaeological mysteries of Easter Island’s Rupa Nui National Park on this enthralling half-day excursion. Gaze in wonder at the distinctive ‘moai’ stone sculptures and gain insight into the island’s captivating history with an expert guide. Marvel at ancient masonry as you wander the verdant enclave of the park, appreciating stunning panoramas of the ocean. Visit the picturesque harbor town of Hanga Piko to observe a ceremonial moai, the stonework of which has perplexed experts for centuries. LD: Depart from your hotel in Hanga Roa in a comfortable, air-conditioned minivan to begin your enriching exploration of the Rapa Nui National Park, a cultural and natural sanctuary that sprawls across the majority of Easter Island. Alongside your expert archeologist guide, wander among 900 characteristic moai sculptures and discover their fascinating origin; carved from solidified volcanic ash, the precise masonry of each statue has mystified experts for centuries. Visit the sprawling ceremonial site of Ahu Vinapu to see some of the most advanced masonry in the world, then continue north to Puna Puna to see alternative representations of maoi sculptures; note the distinctive red knots atop their heads, made from red scoria, an igneous rock with a vibrant red hue. Refresh with a relaxing rest at the harbor of Hang Piko, not forgetting to examine the sacred structures deemed protective of the fishermen. 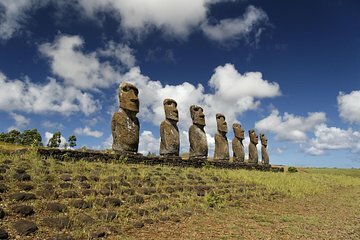 See, too, the colossal moai sculptures of Ahu Akivi, a line of seven 16-foot (5-meter) effigies that gaze solemnly out to sea; the sea-facing direction of the sculptures has confounded archaeologists for years due to the fact all of the other sculpture face inwards. Listen as your guide reveals intriguing theories regarding the reason for this anomaly. Relax during your journey back to your hotel, where the engaging exploration of Easter Island concludes.